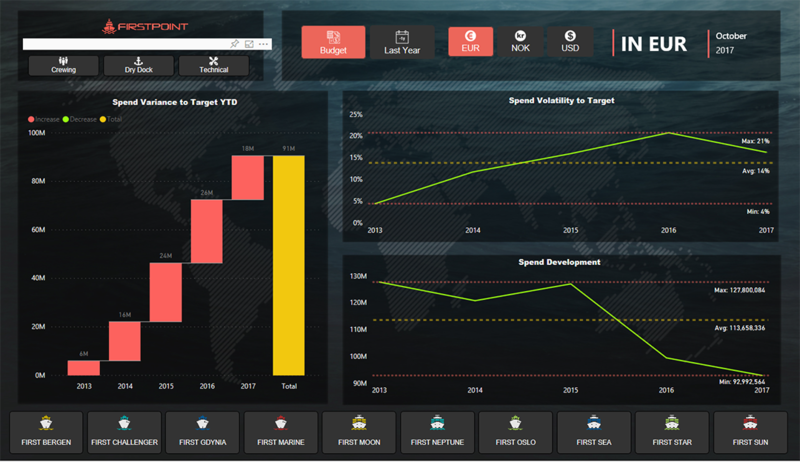 As part of Firstpoint’s effort in the maritime market, they have developed the concept Intelligent Ship Operations. This is a complete solution for enabling shipping companies to take advantage from the huge potential available in Big Data platforms. It is a modular service that can be tailored to each company’s individual setup, available sensor and data streams as well as Business Intelligence needs. 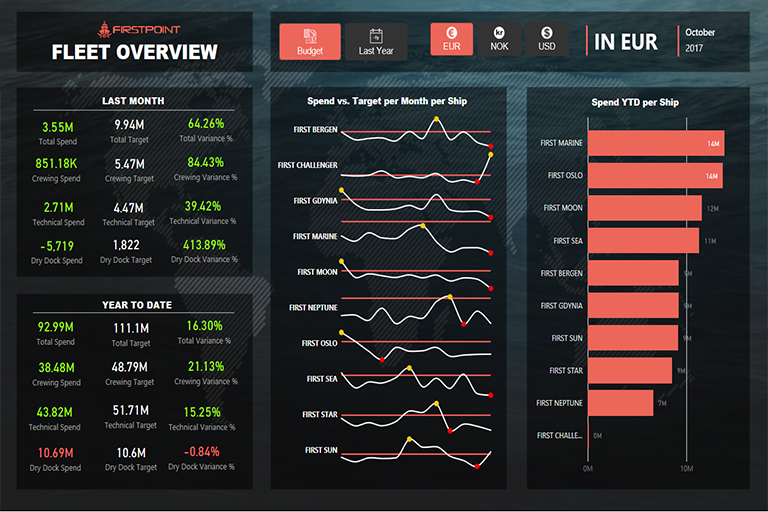 Firstpoint’s solution delivers a comprehensive overview of a shipping company's fleet performance. 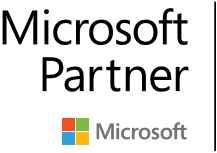 By utilizing Power BI, with a data warehouse being updated daily as a data source and a PowerApp for manual input and forecasting, Firstpoint delivered a modern solution that enables an overview of the company's most important KPIs. The shipping sector has traditionally been slow on the uptake of new solutions and services. This has led to a situation where a lot of the current shipping fleet are operating on outdated systems and software with complex and manual business processes supporting the operation. More specifically, the shipping company's old reporting systems have relied heavily on manual processes and lacked an overview of data from several systems. They requested a modern solution that would enable key decision makers to make informed decisions based on up-to-date data. 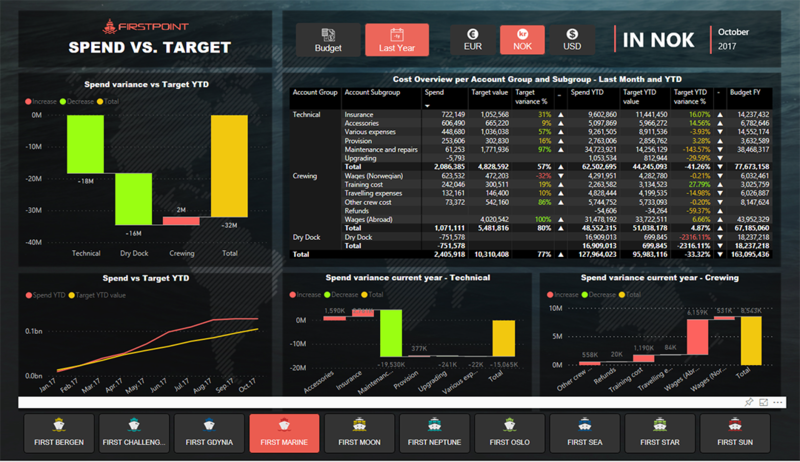 Part of the Intelligent Ship Operations solution is the Expense report being showcased. While vessel operating costs are expected to rise, repairs & maintenance and spares are cost categories which are likely to increase more significantly, making tracking costs a crucial part of the ship operations. The report consists of several tabs, each one tailored to meet a specific person's or department's needs and allows for a filtered view with different currencies, and comparing the actual with either budget values or last year's performance in different points in time. 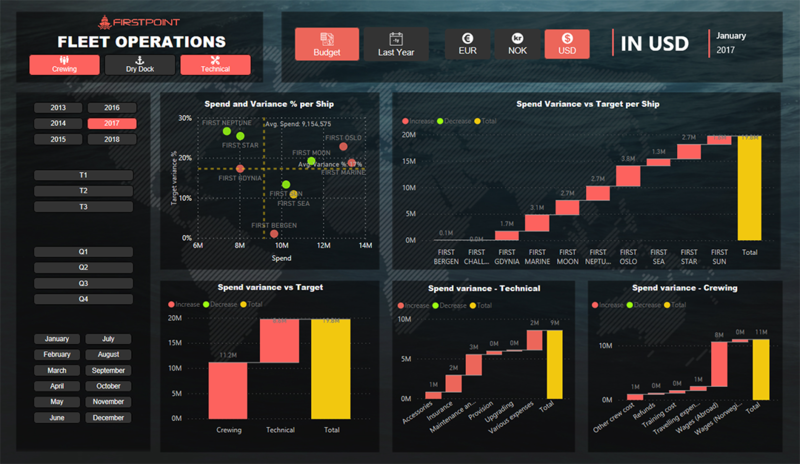 Drilling-down or filtering to each individual ship provides the level of detail needed to monitor each ship's performance.